The Freedom From Religion Foundation is appreciative that an upcoming exhibition in Milwaukee on the diversity of faith is truly diverse. “Gratitude: Faith/Diversity,” a collaboration of the Milwaukee Institute of Art and Design and the Interfaith Conference of Greater Milwaukee that is being displayed at the Milwaukee City Hall, includes a Freethought banner in its 15 exhibits. In fact, the banner image was submitted by FFRF part-time Administrative Assistant Katrina Treu, who also attends the Milwaukee Institute of Art and Design. The images will all be up at the City Hall from Monday, Nov. 19, as part of a traveling exhibit. In addition to the City Hall, the banners will also be displayed in November in Milwaukee at the Jewish Community Center and the Milwaukee Institute of Art and Design. The City Hall exhibition will be launched with a grand reception starting at 5:30 p.m. on Nov. 19 in the rotunda. Attendees are encouraged to bring food items in for donation to the Hunger Task Force. The show is sponsored by the ELM II Fund of the Greater Milwaukee Foundation. The exhibition is free and open to the public. The Freedom From Religion Foundation is a Wisconsin-based national nonprofit organization with 32,000 members across the United States, including more than 1,400 in Wisconsin. FFRF’s purposes are to protect the constitutional principle of separation between state and church, and to educate the public on matters relating to nontheism. 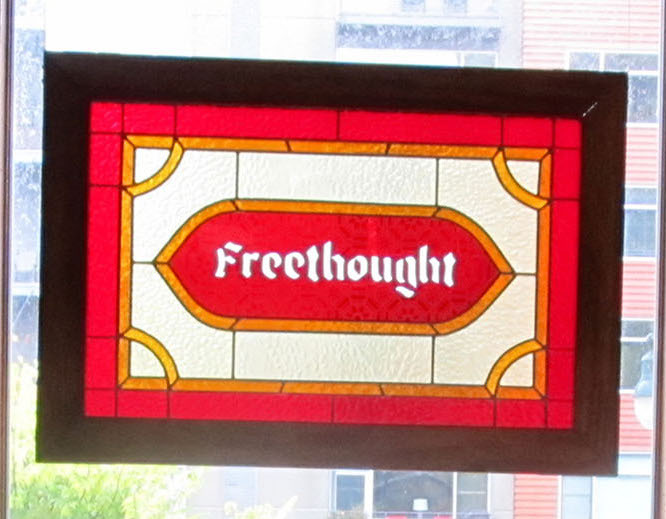 It is pleased to see an art exhibition in its home state acknowledge the presence of freethought.